“If I Had a Dollar” is a series that highlights one useful or entertaining app per week that costs less than $1. Skip your vending machine soda and try some new apps! The holidays are an important time for a smartphone: Either you’re just about to get a new one, you know someone that will, or you’re using the one you already have to whisk you away to a land far far away from your raucous family. Whether you’re interested in helping smartphone newbies take advantage of their new devices or eager to get your game on with a friend, it’s hard to ignore QuizUp — the uber-popular iOS(s aapl) quiz game that’s likely to be the next Candy Crush Saga. 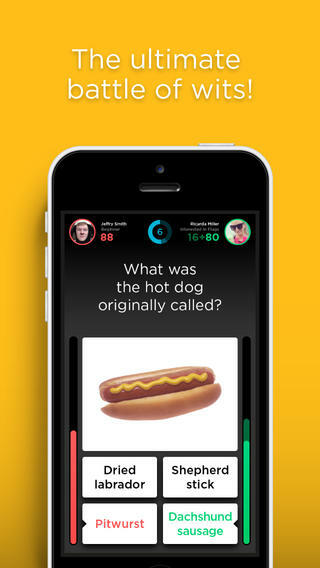 QuizUp is a head-to-head quiz challenge that is played in real time, either with a friend or one of the game’s 4 million users. Quiz topics are fairly broad, ranging from History to Sports to Pop Culture, and definitely keeps the vibe of most weekly bar quizzes. Users are not only given points for guessing correctly, there are also bonuses for answering quickly. So having fast fingers is key, but not so fast — a misstep or a wrong answer means no points. It’s hard to tear away from QuizUp‘s addictive qualities: truly interesting questions keep the brain churning, and it’s especially fun when paired with a friend on equal footing. But there are some downsides. The random match system is all well and good, except gamers are free to chat each other while the game is going on. This can often lead to the presence of trolls, making the game more about avoiding creeps than solving questions. But with a healthy number of friends, QuizUp is a real treat. QuizUp isn’t available yet for Android(s goog) (although developer Plain Vanilla Corp promises it will be soon), but that doesn’t mean there aren’t new games to spend that dollar on. 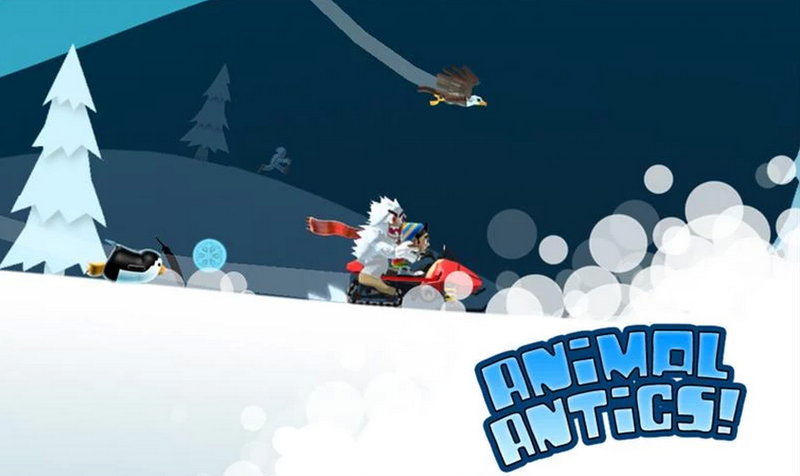 Ski Safari is a welcome example of a fun, easy-to-pick-up game that will get newbies addicted to mobile gaming and still provide entertainment for those who’ve seen it all. The premise of the game is pretty simple: users control a hapless skier, Sven, as he stays one step ahead of a giant avalanche. The downhill mechanics make it important for users to learn how to time momentum and chain combos, but the controls are forgiving enough and easy to learn for all ages. And, if the original version doesn’t strike interest, developer Defiant Development also released a version in partnership with Cartoon Network show Adventure Time. Unfortunately, even for a casual game, the depth of Ski Safari can be a bit wanting. There still aren’t many immediately accessible levels, which can be a bummer for those who like to feel progress. But recurring objectives and new power-ups do mean that Ski Safari does have decent shelf life. These buzzy games will bring entertainment for everyone around the tree for not a ton of cash, and they’re great recommendations for new phone owners. Download QuizUp for free on the iTunes App Store and Ski Safari for $0.99 on Google Play. Do you have an app that is worth my dollar? Send it to me at lauren.hockenson@gigaom.com with “Dollar App” and the app’s name in the subject line. Looks like I will have to try out these games. I also like the free ones on the iPad and iPhone. You should check them out as well.